Pronounced “skleer-oh-DUR-muh”, it is a disease that involves the hardening and tightening of the skin and connective tissues – the fibers that provide the framework and support for your body. 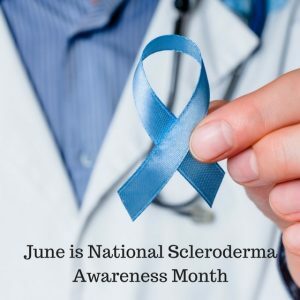 June is Scleroderma awareness month. The entire month has been dedicated to this disease because so few people know about it, but yet, there is an increasing number of people being diagnosed with the disease. And, since awareness of the disease is low, many researchers do not always receive the resources they need to better understand the cause, symptoms and find a cure. Scleroderma affects women more often than men and most commonly occurs between the ages of 30 and 50. While there is no cure for this disease, a variety of treatments can ease symptoms and improve quality of life. Skin. Nearly everyone who has scleroderma experiences a hardening and tightening of patches of skin. These patches may be shaped like ovals or straight lines, or cover wide areas of the trunk and limbs. The number, location and size of the patches vary. Digestive system. In addition to acid reflux, which can damage the section of esophagus nearest the stomach, some people with this disease may also have problems absorbing nutrients if their intestinal muscles aren’t moving food properly through the intestines. Heart, lungs or kidneys. The disease can affect the function of the heart, lungs or kidneys to varying degrees. These problems, if left untreated, can become life-threatening. In some cases, the skin problems associated with scleroderma fade away on their own in three to five years. The type of scleroderma that affects internal organs can worsen over time and require a variety of medications to help control symptoms and prevent complications. If you have more questions or concerns about Scleroderma, you should consult your doctor.